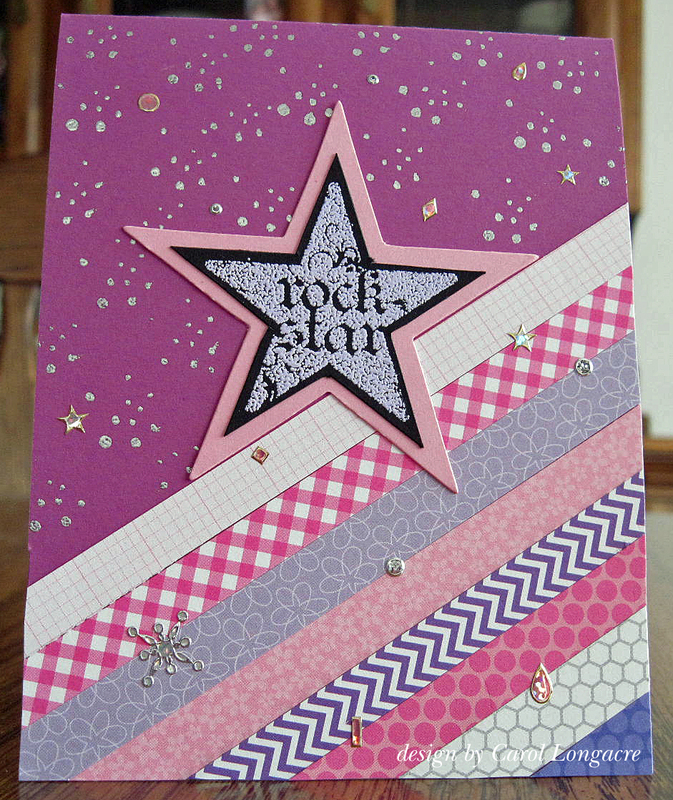 Here's a card made for a teen-age girl using colors of orchid, pink and purple. I made use of some assorted strips of dsp with a diagonal design, and added a silver heat-embossed sentiment star, matted with pink. The background was done with a spatter stamp in versamark, then heat embossed with silver ep. Mixed in with the silver embossing are some assorted shapes of pink geo sparkler stickers and tiny silver star and snowflake stickers to add some sparkle. Teen girls love sparkle, right? I'm sharing this over at the Simon Says Stamp Wednesday challenge which is to make it "sparkle and shine." So lovely with these colours, Carol!! Love the embossed background and the dp strips combo! Beautiful centerpiece with the sentiment in the star! This is a terrific card for a teen or tween girl. Love all the stickers and those strips of paper will cheer anyone up. Have a fabulous day. It is cooler here today and I hope it is in PA. also. A fabulous card Carol, pretty colours and perfect design for a teenager. A super card for a young girl. I love the coloured papers and the silver star and splatters. Perfect card for a teenager. I have one to make next month so I may borrow this idea!! Fabulous and perfect! Love the design. I keep saying I need to use that design and then forget. Thanks for the inspiration. Very pretty! I bet she liked this card! I know I like it...and I really like the design! I feel a case coming on...smile.